Hover over hotspots to display feature. 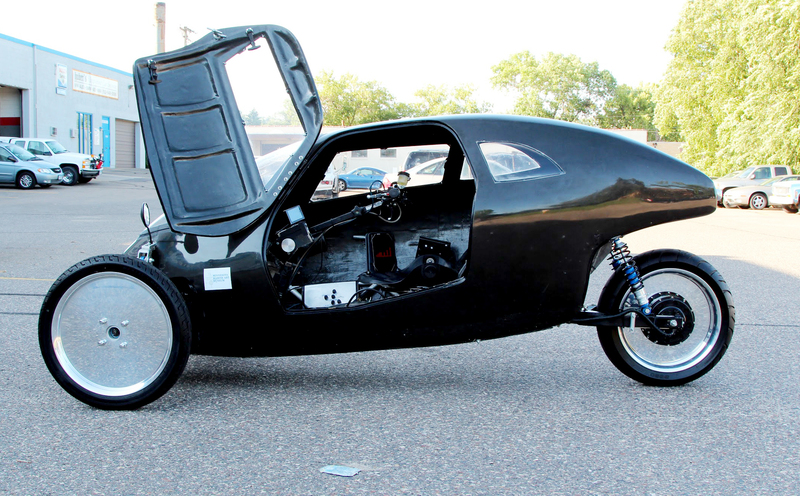 Very Efficient Vehicle Electric hybrid drive system utilizes driver’s own energy, plus lightweight, 3 wheel design may make Raht Racer most efficient highway vehicle ever. Exercise Machine on Wheels Computer runs exercise programs while driving and displays driver performance data. High Output Pedal Generator Pedals are connected to the generator, not the wheels, pedaling generates electricity that recharges the system. Highway Speed Pedal Power System senses pedal cadence, torque and amplifies it to automobile speeds, giving rider sensation of super human strength like Ironman. When you pedal, you go as fast as a car. Road-Safe Weather Proof and Storage Composite body, roll cage frame, air bag, seat belts, DOT lights – safer than a motorcycle or bicycle on busy streets. Terrain Sensing Mode The onboard system senses hills and adjusts resistance based on actual terrain. Gearing System Adjusting Gearing is variable, allowing you to go at high speeds with minimum or maximum effort. It’s your choice.